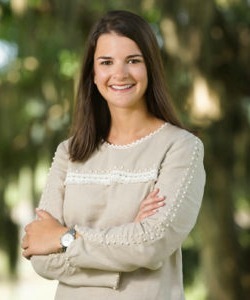 Meg Wynne is a Realtor with Berkshire Hathaway HomeServices Bay Street Realty Group, a Real Estate firm located in Beaufort, SC. Meg is a graduate of the University of South Carolina, where she received her BA in Education. After teaching Title-1 for several years in Charleston, SC, the opportunity to move to Beaufort arose. Meg and her husband Rob jumped at the opportunity and have never looked back. As the second oldest city, nestled in the lowcountry of South Carolina, Beaufort’s natural beauty and incredible architecture captures Meg Wynne’s attention and heart. Being a Real Estate Expert comes naturally for Meg. She brings her knowledge of design and the building industry to the table when helping you buy or sell in the lowcountry. Meg uses the most innovative tools when helping her clients. Meg stays up to date with the latest technology and market tools. In Meg’s free time she enjoys living the quintessential lowcountry life. When away from the office you can find her boating, cooking or giving back to the community in which she lives. Meg thoroughly enjoys volunteering with Historic Beaufort Foundation, Junior Service League of Beaufort and CAPA (Child Abuse Prevention Association).